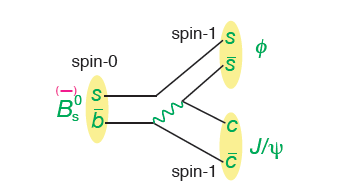 This year CP violation in the Bs meson system has made the news, including BBC News and American Gardener. 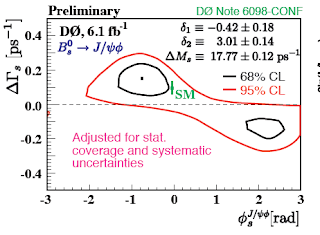 The D0 measurement of the same-sign dimuon asymmetry in B decays got by far the largest publicity. 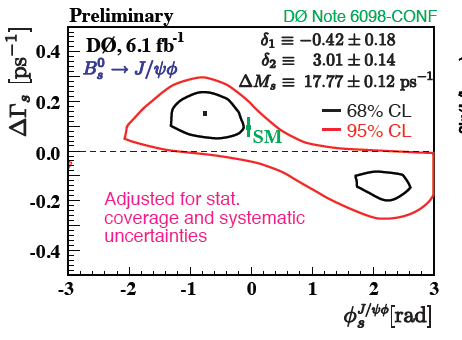 Recall that Tevatron's D0 reported 1 percent asymmetry at the 3.1 sigma confidence level, whereas the standard model predicts a much smaller value. The results suggests a new source of CP violation, perhaps new heavy particles that we could later discover at the LHC. or merely hints of complicated systematical effects in their detector. Wow, what a conference! Thanks for the fantastic reporting. Don't forget that phrase in the two D0 arxiv papers ... "assuming CPT invariance". oops, sorry ... I was thinking of the OTHER recent D0 result on Bs mesons. 1.5 sigma is not a hint of anything. This is dead.